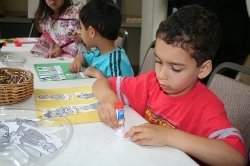 First Kids offers a wide range of after-school classes in art, dance, music, martial arts, performing arts and foreign language designed to broaden and enrich the student learning experience. Classes are held after school on the First Lutheran campus, and are available for an additional fee. Arts Alive offers classes on campus after school in strings, drums and wind instruments by professional music teachers. 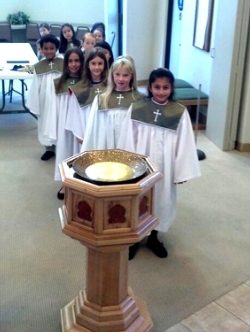 In the Children's Choirs offered through First Lutheran Church, children as young as four years old learn songs of praise and perform as a group at special worship services. The choirs meet on campus after school. Spanish language instruction is offered throughout the school for students in developmental kindergarten through fourth grade. Middle School students can be members of the yearbook staff, which meets weekly after school to produce the school's annual memory book. Academic Chess challenges students to improve critical thinking and problem-solving by learning and practicing the game of chess. The MATHCOUNTS club at First Lutheran is for students who enjoy math and competing in regional math competitions. Homework Clinics taught by First Lutheran teachers each quarter give students additional help with their classroom homework. Weekly Math Helps sessions are taught by First Lutheran math instructors for middle school students who need additional help in math. Children from developmental kindergarten through middle school learn the Bible, sing songs of praise and worship together the age-appropriate Kids Clubs through First Lutheran Church: Kids for Christ (DK-first grade), Kingdom Crew (grade 2 and 3), God Squad (grades 4 and 5) and Middle School Youth Group (grades 6 through 8).